I decided to try and find a Northern Shrike (Lanius excubitor) today. The Northern Shrike is a predatory songbird which breeds in the tundra and overwinters in southern Canada and the northern United States. It feeds on small birds, mammals, and insects, sometimes impaling them on spines or barbed wire fences This led me to a series of back country roads through agricultural lands, but I came up empty handed. I did happen to see a few other predatory birds in the area, including a pretty little kestrel and a large Snowy Owl. The winters here in Michigan are pretty long and cold. The cold starts in late November and doesn't leave until the spring, sometimes not even til May. For someone who's interested in herps, this is a long hiatus followed by an all too quick field season. So, in order to make it through the long winter months, I've decided to take up winter birding. Michigan is a pretty popular destination for birding, due to its large migrations during the spring, fall, and winter. Plus, it has a endangered bird that breeds almost exclusively here. But in the winter, we sometimes get visitors from the far north. I've become increasingly interested in some of the owls which occasionally overwinter in Michigan during irruptive years. So what is irruption? According to the Cornell Lab of Ornithology, "Irruptive migration occurs in species that respond to irregular changes in food supplies. For example, the availability of seeds and buds consumed by species such as redpolls and Pine Grosbeaks can vary substantially from year-to-year and from location-to-location. In some years the food supplies in the north may be adequate and the birds remain in the northern forests during the winter. In other years the food supplies are low and the birds move south or to other locations outside of their typical range. These movements outside their normal range are called irruptions...While not in the seed and berry category, some raptors also exhibit irruptive behavior. Northern owls such as the Great Gray Owl and Snowy Owl sometimes exhibit this behavior. Most remain in their Canadian homes throughout the winter. In irruptive years, presumable as the result of poor food supplies, large numbers of these species may move into the northern United States." This means that Michigan can be a prime destination for winter birding. 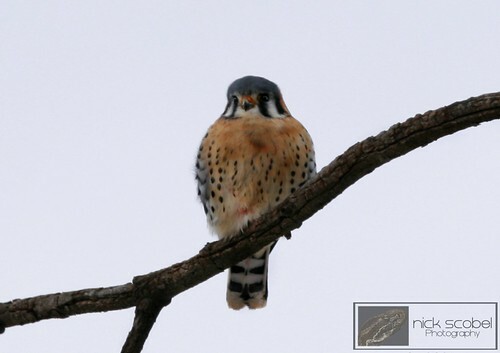 eBird.org has a fantastic database where birders submit their sightings. It can be filtered by species and date of sighting. I decided to look up southeast Michigan and see if there were any local sightings. There were two within a fifteen minute drive of my house. 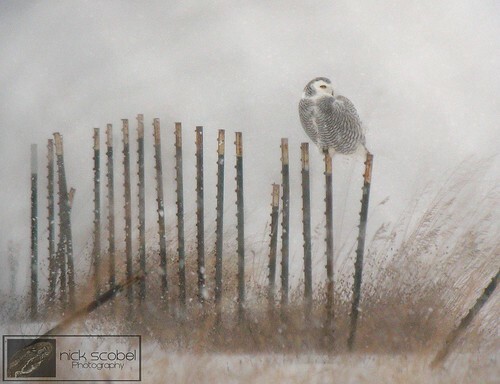 So as a newbie birder, I decided to bundle up, grab my Sibley's and binoculars and head out in search of an irruptive Snowy Owl. My first stop was a series of large agricultural fields. In the far north, snowies inhabit tundra habitat. The tundra consists of large open areas with sparse, low vegetation where the owls can perch on hills or boulders to hunt. Open habitats such as agricultural fields act as artificial tundra during the winter months, and snowies often utilize these types of areas during irruptive years. 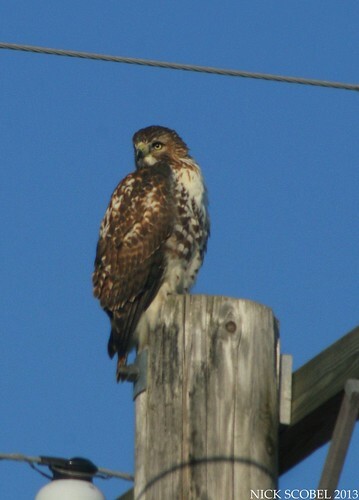 As I turned down a road bordering an agricultural field, I noticed the first of many red-tailed hawks I would see on this day. The bird only sat for a few moments before flying off. I noticed several more utilizing power lines throughout the rest of the day. I also saw a Northern Harrier (Circus cyaneus) through my binocs from about 200 yards away, as well as a few Cooper's Hawks (Accipiter cooperii) in the scattered woodlots around the periphery of the agricultural fields. There were lots of small birds like starlings, finches, and dark-eyed juncos along the hedgerows of the fields. 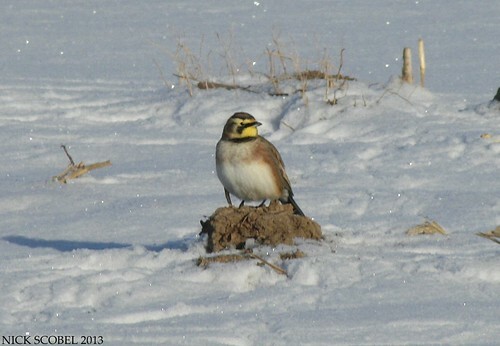 I then noticed some larger, colorful birds hopping around in the agricultural photos, they turned out to be horned larks. I spent another forty-five minutes or so looking for any owls to no avail before moving on to a different area. Like agricultural fields, airfields feature a wide expanses of land with sparse vegetation just like the tundra. I decided to drive a back road which borders the periphery of a large airfield in hopes of seeing the owl that had been recorded in the area about a week earlier. The sun had disappeared, the wind had picked up, and a squall of snow had begin to fall. 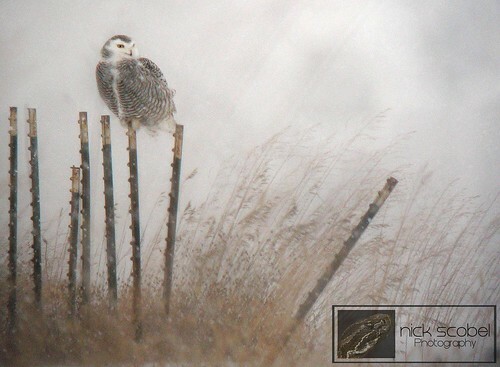 I felt like it would be difficult to spot a large white owl on the snow covered ground, so I was hoping I would be fortunate enough to spot one on a fencepost or power line. As I came around a corner, a large white shape caught my eyes through the heavy snow. There, sitting atop an old fencepost, was a Snowy Owl. I was so excited that I put my car into a bit of a skid when I hit the breaks. I turned around, pulled off the side of the road and grabbed my binoculars. Within a few minutes, another car pulled up. A woman emerged and asked, "Do you see something I don't?" I told her to look out to the fence post, she immediately pulled her car behind me and brought out a large Swarovski spotting scope. She was kind enough to let me fire a few photos of the owl through her spotting scope. The result came out fairly nice, considering the method of shooting, the heavy snow, and the fact that the owl was more than 100 yards away. Several more birders arrived in the coming minutes and we spent about a half an hour observing the bird before it took off and flew directly overhead. It was an awesome experience and I'd like to thank the birders for their knowledge and great company. I may have been bitten by the birding bug, stay tuned for more. And, Merry Christmas everyone! 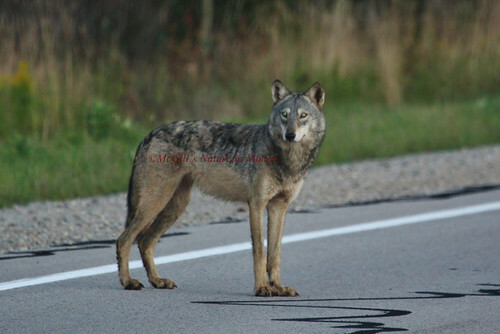 If there's one conservation issue that has been most pressing in Michigan as of late, it most likely has to do with Canis lupus, the Gray Wolf. Once common throughout the Great Lakes region, wolves were nearly hunted to extinction over the past century. As the logging industry became more prominent in the 1800s, wolves were decimated by hummers across the region. By 1838, wolves were extirpated from southern Michigan. By the early 1960s, wolves had become almost completely extirpated from Wisconsin and Michigan, with the exception of Isle Royale in Lake Superior. It was at this time that the two states took action with Wisconsin listing the Gray Wolf as an endangered species in 1957, with Michigan following suit in 1965. This protection finally gave wolves a chance to recover, though the road to re-establish them would be a long one. In Michigan, the wolves were isolated to Isle Royale and very few were seen in the rest of the Upper Peninsula. Things finally changed in the late 1980s when a pair of wolves was found in the central part of the U.P. The pair had pups in the summer of 1991. This would be the beginning of one of the greatest conservation success stories in North American history. Since 1991, the wolf population has gradually increased to where it is today, with an estimate of over 700 wolves in the Upper Peninsula according to the DNR. So wolves has made an incredible comeback here in Michigan, that's good news right? Not exactly. 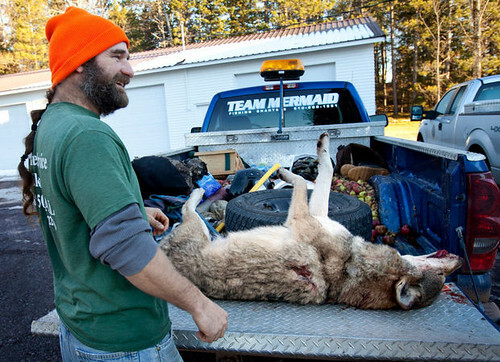 Many residents of Michigan's Upper Peninsula are downright angry with the return of the wolf to the northwoods. Reported conflicts between wolves and human interests have become increasingly troublesome, particularly over the past five years. The most notable of these conflicts are between wolves and domesticated animals, such as livestock and dogs. However, the Michigan DNR has legislation in place to compensate farmers for the full financial cost if an animal is lost. Depredation events involving dogs and wolves have also become a problem, which you can read about on the DNR's website. According to the DNR, the majority of these depredation events occur with bear hunting dogs. Via the website, "Dogs, especially those used for hunting bear, are at risk of being attacked by wolves because they: (1) traverse large areas, which increases their chance of coming near or encountering a homesite; (2) are released at bear bait sites that also may be used by wolves; (3) bark while tracking, which may be viewed as a territorial challenge by wolves; and (4) are oftentimes some distance from the hunters and therefore not protected by the presence of humans." So, hunting techniques and baiting for bear are just as much of a factor as the wolves are in this situation. Despite some of these facts, the DNR opened Michigan's inaugural wolf hunt on November 15th, the hunt runs until December 31st. As of today, December 5th, 19 wolves have been harvested across the tree management units in the Upper Peninsula. You can follow updates on the wolf hunt here. I'm not here to argue one way or the other about the wolf hunt. Wolves are incredible animals and are one of the true faces of the northern wilderness. After so much time, money, and effort was spent to bring them back to the Great Lakes region, I'd hate to see them disappear once more. With that being said, protecting human interests with these predators is just as important. The wolf hunt may very well become a ballot issue for Michigan voters in 2014, so keep yourself informed. Reading comments from hunters which support the hunt have been concerning. "Kill them all for all I care" and "the only good wolf is a dead wolf" are things I've seen thrown around. Like snakes, it seems as though many peoples attitudes towards wolves contain blind hatred and little understanding. I hope that the DNR's plan will help balance the conservation needs of the wolf with the human interests of residents of the Upper Peninsula. And above all else, that wolves will hang on in Michigan in the future.